I love being a city girl. I love being right in the heart of all of the action. I love the ability to walk 2 blocks east and be on the lakefront. I love being able to hop on a train and explore all the nooks and crannies of this fabulous place I’m blessed to call home. Yep, it’s pretty dang cool being a city gal. But one thing I’m not so in l-o-v-e with?? Living in an itty bitty apartment with not enough storage space. Don’t get me wrong. I’m not complaining. I’ve definitely learned to simplify my material possessions since moving into our Chicago pad. I’ve pared down my clothes, I’ve thrown away old shoes, and I’ve weeded through my jewelry. It’s all helped. But the thing is…I still have stuff and that stuff needs its own space to call home. 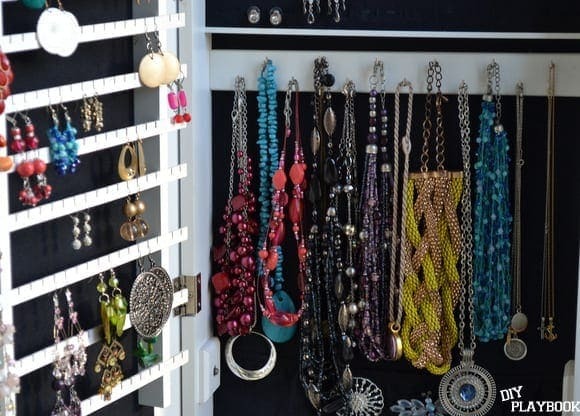 Today I want to show you where I keep all of my jewelry stashed and (somewhat) organized. 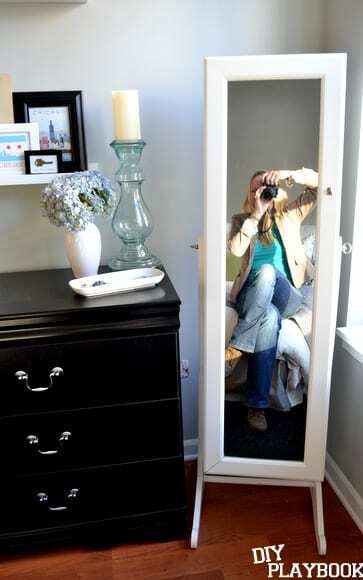 This mirrored jewelry cabinet has been my savior. It’s housed my jewelry for the past 3+ years and I’m pretty much obsessed with it. Prior to having this little guy, my jewelry was a big tangled mess. Think wads of necklaces tangled together, missing earrings, baggies of bracelets…it wasn’t a pretty sight. 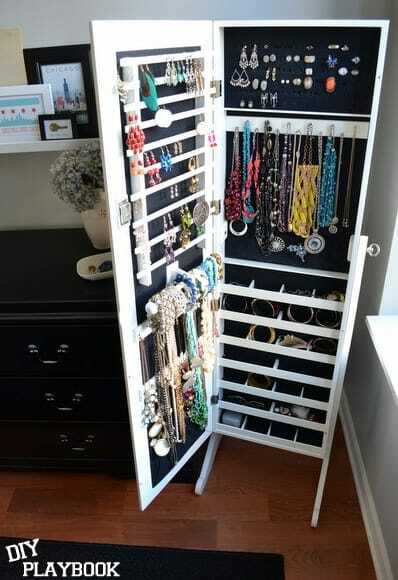 This cabinet works for me because it hides all of my jewelry clutter. 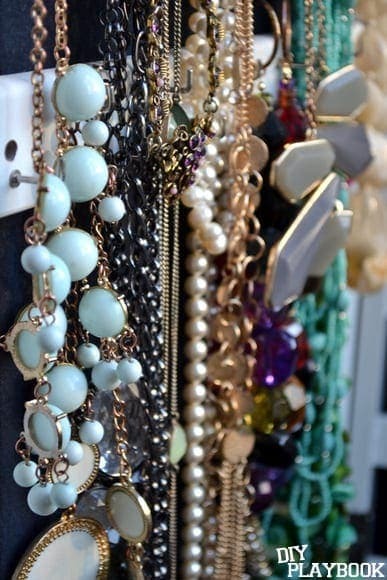 I’ve seen plenty of gorgeously girly jewelry displays via Pinterest and other blogs. I love the look, but I don’t love the look for me. 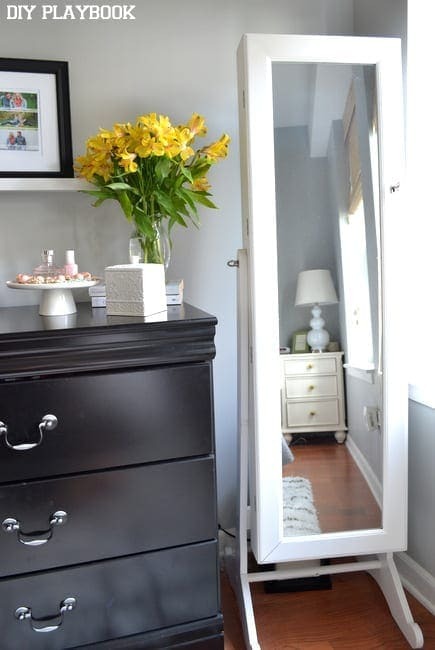 I like my clutter to be hidden and this mirrored cabinet does just that. 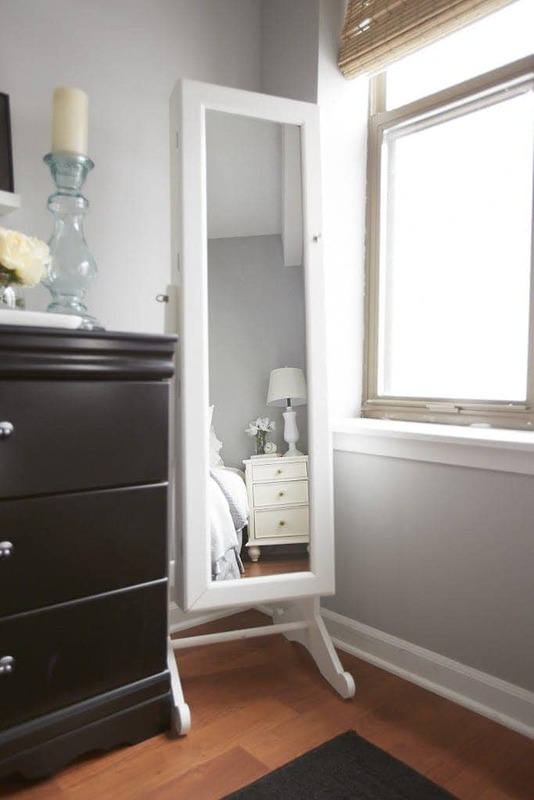 Plus it offers a full-length mirror, which always comes in handy. 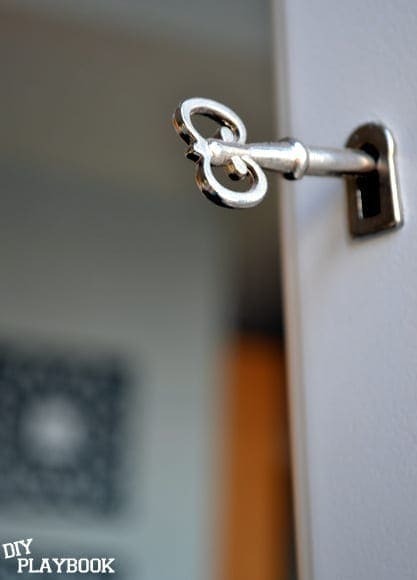 I feel like a little girl with a key to her locket, but the cabinet really does have a key that works! 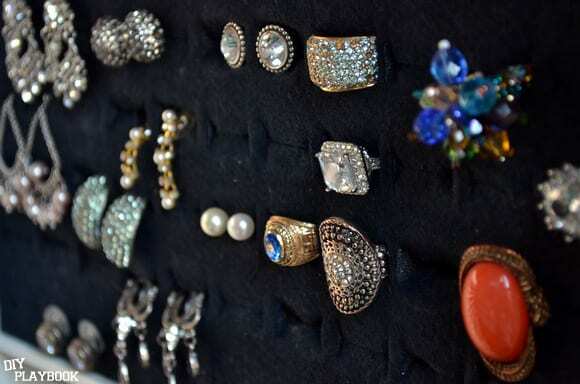 In fact, when we moved I took expensive jewelry with me in my suitcase, and I then locked up the rest in the case. Once we got to our new home, I simply unlocked it and reorganized the shuffled around contents. Inside there are areas designed for necklaces, rings, bracelets, earrings, and just about everything in between. I like it because I can see everything I have right in front of me. 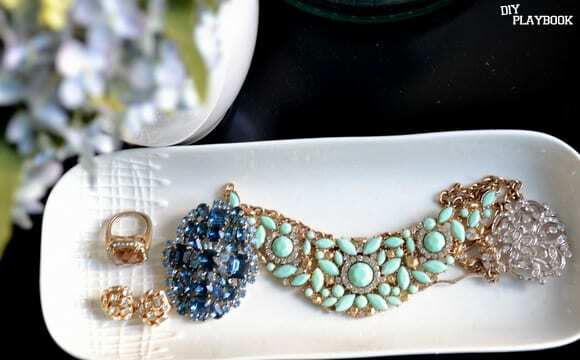 So if I’m trying to find the perfect necklace to go with my outfit, I can see all the colors I’ve got right there. 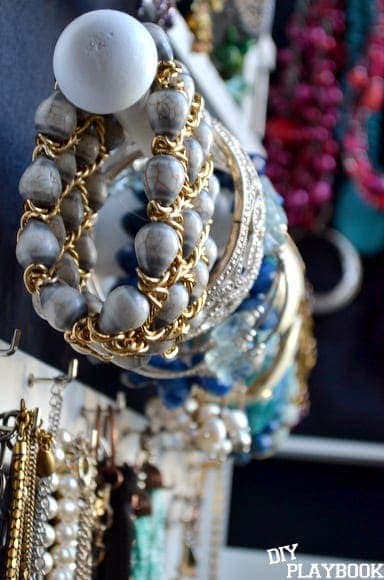 It makes my mornings a heck of a lot easier, and I find that I wear a wide variety of stuff…instead of just the same jewelry day in and day out.